The present water shortage, decreasing water quality, and increasing processing supply and cost are the concerning factors for automation in the waterindustry. Hence, the events related to the water treatment, intake, distribution and transmission are important. Instrumentation, control, and automation therefore, are the key technologies for modern water and waste water systems in the water industry. Purification and waste water management take place with different technologies, instruments, and treatments. 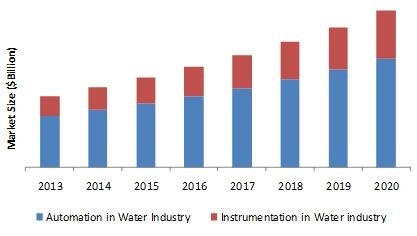 The Americas is the major market for water automation and instrumentation industry; however, Asia-Pacific is expected to grow at the highest CAGR of 12.07% from 2014 to 2020.The process stage market for water automation and instrumentation industry can be divided into collection, treatment, and distribution. The treatment market accounts for a better share compared to collection and distribution markets. The report provides the profile of all major companies in the water automation and instrumentation industry. The report provides the competitive landscape of the key players, which indicate the growth strategy of the market. The report also covers the entire value chain for the market from the raw material supplier to the end user. Along with the value chain, this report also provides an in-depth view on the process stage, automation technology, instrumentation, end user application and the drivers and restraints for water automation and instrumentation industry. The water automation and instrumentation market is estimated to reach $17.73 billion by 2020, at a CAGR of 11.75% from 2014 to 2020. The report also provides the water automation and instrumentation market dynamics such as drivers, restraints, and opportunities. Apart from the market segmentation, the report also includes the critical market data and qualitative information for each product type along with the qualitative analysis, such as the Porter’s five force analysis, value chain analysis, and market crackdown analysis. The major players in water automation and instrumentation market are General Electric (U.S.), Siemens AG (Germany), ABB (Switzerland), Emersion Electric (US), Rockwell Automation (US) among others. The process stage market for water automation and instrumentation industry includes collection, treatment, and distribution of water. The technologies used in this market are distributed control system, supervisory control and data acquisition, programmable logic controller, human machine interface, manufacturing execution systems, identity & access management, and laboratory information management system. The instrumentation market for water automation and instrumentation water industry consists of pressure transmitter, level transmitter, temperature transmitter, electromagnetic flowmeters, sludge density measurement, gas and liquid analyzer, leakage detection systems, control valves, and high & low ACdrives. The major end user applications of water automation and instrumentation industry are drinking, household, commercial, industrial water, and others. The market is segmented by geography into four different regions; namely Americas, Europe, Middle East, APAC, and Africa. Automation and instrumentation is the basis of most of the advanced control techniques that exist in the modern industry. It is through the further growthof automation and instrumentation that the industry, as a whole, will address the current challenges that it faces and move forward into the future. The global market for water automation and instrumentation industry is primarily driven by the increasing water scarcity and growing complexity of water management in water utilities and plants. In this report, an in-depth market analysis has been drawn to craft a vision for automated water network solutions and their potential benefits for utilities and their stakeholders. With growing advancements in technologies, the future of automation and instrumentation of water networks is expected to rely on partnerships between the people and technology to address water scarcity. This report on the automation and instrumentation market in the water industry aims to feature the summation of equipment, components, systems, OEMs, and contractor services involved across the value chain in the industry. This report also aims to capture the industry roadmap with regards to the market sizein terms of value and volumemarket dynamics, applications and product trends, geographic analysis, and price trends. The report is segmented into process stage, automation technology, instrumentation, end-user application and geography; each of these segments is further divided into sub-segments.The total market size of the collection process for water automation and instrumentation industry is expected to reach $17.73billion by2020 atan estimated CAGR of 11.75% from 2014 to 2020. Some of the major players in the market are Schneider Electric Corp (France), Pepperl+Fuchs (U.S.), Rockwell Automation (U.S.), ABB (Switzerland), CH2M HILL (U.S.), Emerson Electric Company (U.S.), Endress+Hauser Consult AG (Switzerland), General Electric (GE)(U.S.), Mitsubishi Electric Corp (Japan), Siemens (U.S.), and Yokogawa Electric Corporation (Japan).